The page above is from a recent client letter, cover page reproduced below. It may seem a bit out of place to be concerned about how corporate bonds will perform in a rising rate environment, just days after the Federal Reserve said it would keep short-term rates near zero until mid-2015 (almost 3 years from now). However, interest rates must eventually rise. Investors, and nations will not be willing to hold bonds at negative real rates of return forever. Additionally, the bond market might begin to create its own forces at some point that the Fed cannot neutralize. There was a period of about 40 years of rising rates peaking in 1981 (creating a headwind for bonds), and a period of about 30 years of falling rates from 1981 through today (creating a tailwind for bonds). 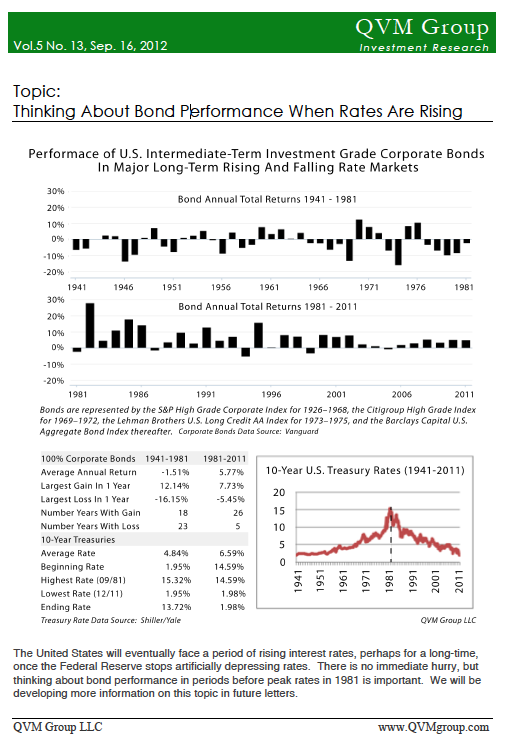 Most of what the majority of investors know about bonds comes from the last 30 years, and not the prior 40 years. Bonds have not only been helpful to reduce portfolio volatility in the past 30 years, but they have been favorable total return generators. How did they play in portfolios from 1941-1981 when they faced a headwind? We will explore that in client letters over the coming year, to get you and us informed and prepared for the day the direction of interest rate changes reverses. The attached one-page letter, provides some good basic chart and tabular information about the differences between the 1941-1981 period and the 1981-2011 period. We will depart from and build from there in future letters. This entry was posted on Monday, September 17th, 2012 at 5:25 PM and is filed under Analysis, Data, Interesting Charts. You can follow any responses to this entry through the RSS 2.0 feed. Both comments and pings are currently closed.